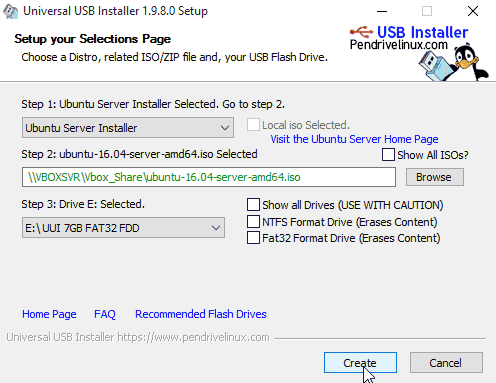 In this tutorial I will explain how to make Ubuntu bootable USB flash drive in Microsoft Windows using the Universal USB installer. You need couple of things before start creating the bootable USB drive. Ubuntu ISO Image - The first thing you’ll need to do is to download Ubuntu ISO image. Depends on your requirement you can download Ubuntu server or desktop ISO image from Ubuntu Website. USB Pen Drive - For Ubuntu server, you will need at least 1GB free space, for the desktop version you need at least 2GB free space. Universal USB installer - On Windows, we use Universal USB installer software to create a Ubuntu bootable USB drive. You can download the software from pendrivelinux.com. The installer is a windows .exe file which you can run without installing to your computer hard drive. Run the Universal-USB-Installer.exe file and accept the License Agreement. Under the Step 1, choose Ubuntu (For desktop version) or Ubuntu Server Installer. Next, click on Browse and select the Ubuntu ISO image you downloaded. Under Step 3, select your USB pen drive from the list and then click on Create. Finally, you will be asked for the final confirmation. Double-check everything and Click Yes to make Ubuntu bootable USB drive. The installation process will take several minutes to complete, depending on the speed of your pen drive and your computer. To boot your computer from flash drive, you will need to change the boot order from the BIOS menu. Plug the flash drive and restart the computer which you want to install Ubuntu. Follow the onscreen instructions to open the boot menu. You'll normally have to press a key (such as delete, F2,F10,F11,F12 or esc) to access Bios settings, but the process differs from one computer to another. On the BIOS settings you will find the boot section where you can choose to boot from a USB stick. While optical drives certainly still have their place, Newer computers and smaller computers tend to not have optical drives anymore.